How to Make Banana Sushi Rolls, the absolute best sweet and crunchy snack idea. A fun, healthy and quick snack with endless combinations! This is how we do ittttttt.. Finally sharing my super simple and easy tutorial on making banana sushi rolls, has me literally singing “this is how we do it”. Am I lame? Yes, but I am so excited to share this blog post with you guys today. One of the most requested posts ever for the blog. You guys know my banana sushi love turned into quite an obsession over the past couple years. I first shared this on Instagram back in the day then resurfaced the snack about a year ago and since then, it is something I share all the time. Whether it’s on stories, a post on my feed, anything. It is one of my go-to snacks when I want something satisfying, easy and honestly just fun to eat. What’s the point of eating if ya can’t have any fun with it anyways? Banana sushi is messy. 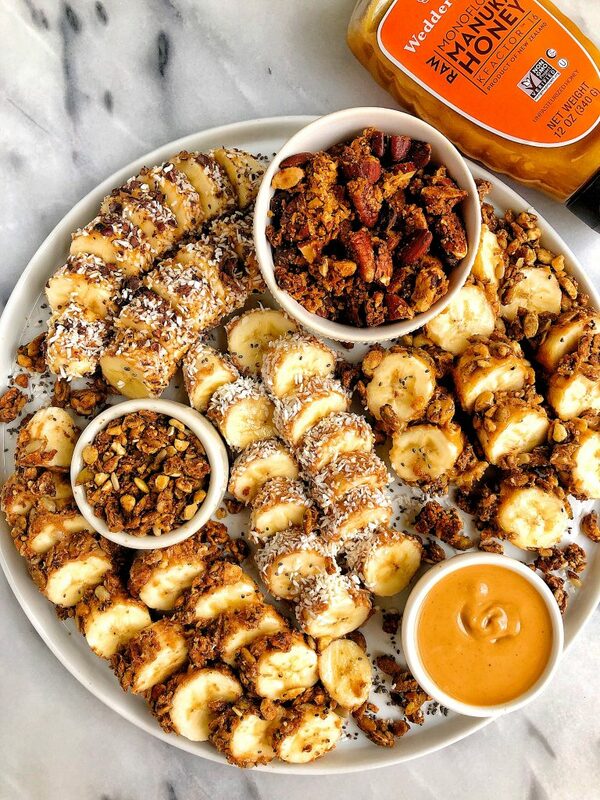 I have yet to really make this and not spill granola on my counter and get peanut butter all over my hands but just go with it. 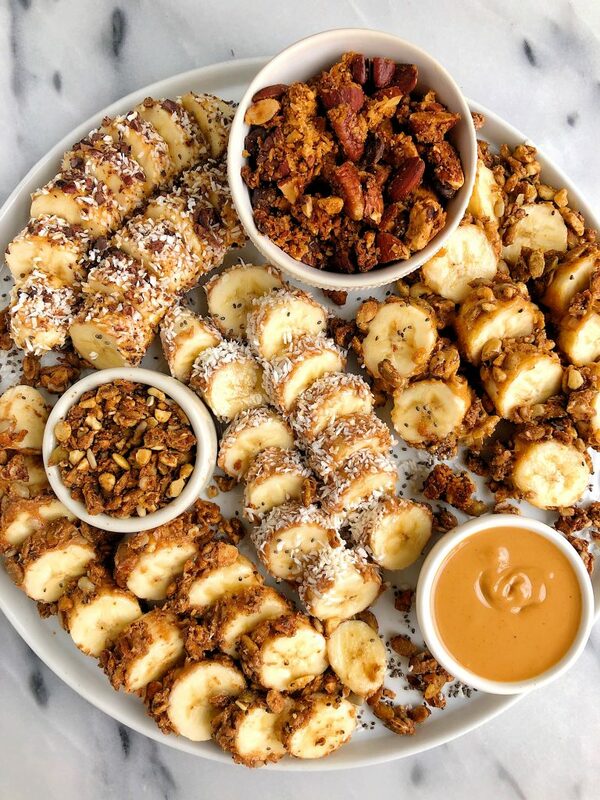 If you don’t like a mess, I recommend using a fork to eat it and try to keep things as neat as possible when rolling the banana in the toppings. The possibilities are endless for toppings and combinations. I always use a nut butter and honey mix as the base and first layer then roll it in whatever I have on hand. Sometimes its granola, coconut flakes, chocolate chips, anything! I use Wedderspoon’s Manuka Honey, which you know is my go-to honey for everything non-baking related. 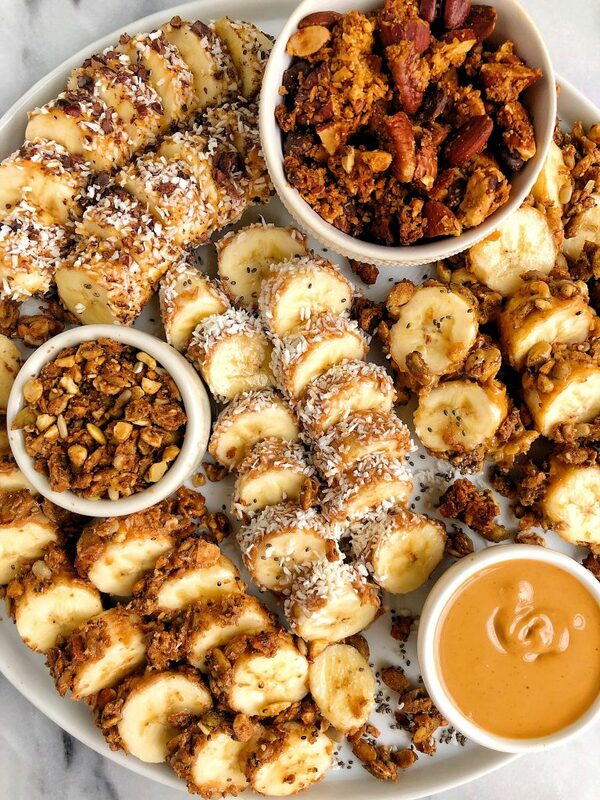 It adds the perfect little touch of sweetness (and stickiness) to the banana to help the toppings keep. This snack tastes best day of but you can also freeze it for a couple days and eat it as a frozen treat. I like doing this is if I cover the banana in some chocolate too! *Will stay good in fridge for about a day or you can freeze this! Thank you Wedderspoon for sponsoring this post! Lovely recipe. I’m definitely going to make this, it looks so good.